We teach our children not to judge people by their skin color. However, we judge someone’s beauty based on many different parameters including their skin texture and quality. Regardless of skin color, we all wants to look beautiful. 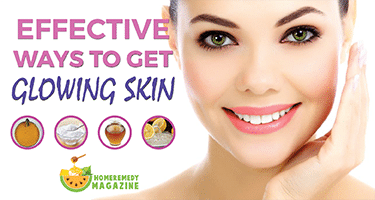 Every woman wants to know how to get glowing skin naturally. They want a picture-perfect shining, radiant skin. But many things prevent them from getting a perfect skin. Applying commercial product on your skin is not a good option. It is like ruining your skin for an instant glow. 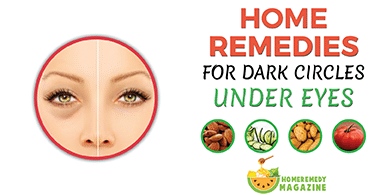 Home remedies for glowing skin are very effective for getting a natural rosy skin. You can get glowing skin easily. Here are the 5 most effective ways listed. You can use your preferred one. Honey has moisturizing properties that help to get a clear skin. It also has antibacterial properties that prevent any skin infection. 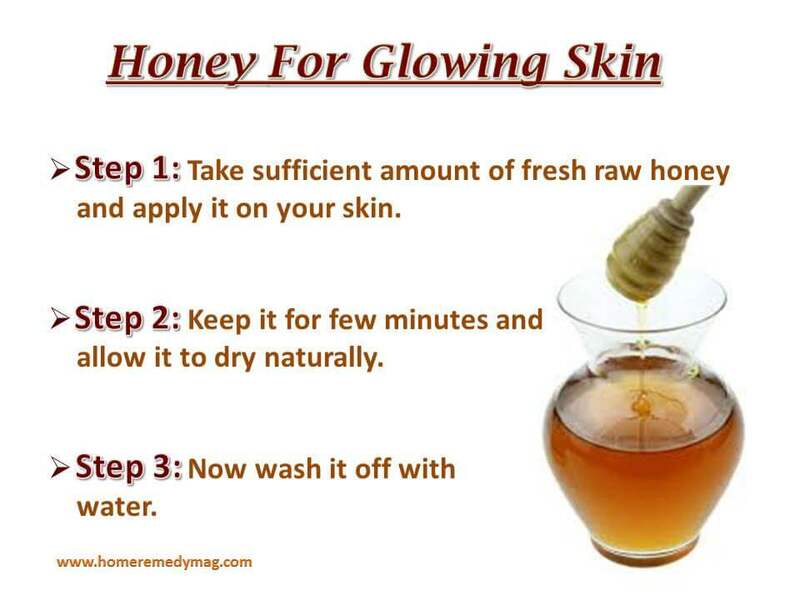 Step 1: Take sufficient amount of fresh raw honey and apply it on your skin. Step 2: Keep it for few minutes and allow it to dry naturally. Step 3: Now wash it off with water. This method is known as a natural facial pack. Take one teaspoon of honey, two teaspoons of milk and one gram of flour. Mix all the ingredients together. Now apply the mixture on your face. Leave it for thirty minutes and after that, wash your face with lukewarm water. Note: Honey helps to get a soft glowing skin naturally by moisturizing the skin. So the first remedy needs to apply every single day for a month. Use the second method at least once a week. Vitamin C helps reduce dark spot from the skin and citric acid makes the skin clearer by removing the dead cells. Do you know any other natural ingredients that consist both of the nutritional properties rather than lemon? Step 1: First of all take some fresh-squeezed lemon juice and two thick slices of cucumber. 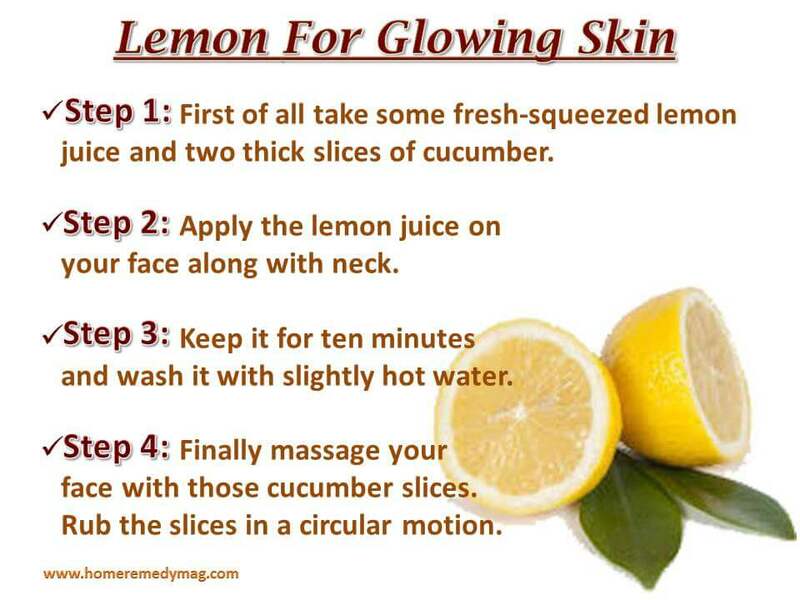 Step 2: Apply the lemon juice on your face along with neck. Step 3: Keep it for ten minutes and wash it with slightly hot water. Step 4: Finally massage your face with those cucumber slices. Rub the slices in a circular motion. Take half of a lemon juice and two tablespoons of fresh honey with it. Apply the pack on your face and keep it for twenty minutes. Now wash off your face with lukewarm water. Note: Lemon has the natural bleaching properties, that make better your overall skin condition. Apply either of the methods on every other day. 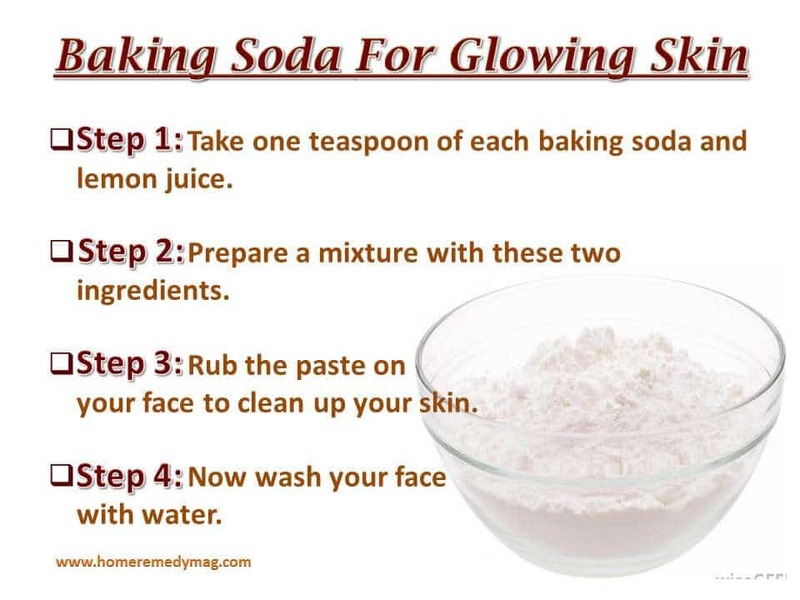 Baking soda helps to maintain the pH level in the skin. Meanwhile, the anti-inflammatory and antiseptic properties that present in baking soda also help to prevent many skin related problems such as pimples, acne or black spots. Step 1: Take one teaspoon of each baking soda and lemon juice. Step 2: Prepare a mixture with these two ingredients. Step 3: Rub the paste on your face to clean up your skin. Step 4: Now wash your face with water. Prepare a mixture with one teaspoon of each baking soda and fresh raw honey. Apply the mixture on your wet face and let it work for few minutes. Now wash your face with water. Note: Repeat the first method two to three times every week. It is enough to do the second process three times a month. Turmeric has excellent skin-lightening and antiseptic properties that help to get scars and mark free skin. The infectious and inflammatory properties that present in turmeric powder contribute to fighting against any skin disorder. You can watch this video to know how to get glowing skin using turmeric powder. Step 1: Take one tablespoon of turmeric powder and sufficient pineapple juice. Step 2: Prepare a paste type of mixture with these two ingredients. Step 3: Apply the method on your face and neck. Step 4: Leave it, until the paste gets dry. Step 5: Now wash it off with water. Take equal amount of turmeric powder and flour. Now prepare a paste with these two ingredients with a little amount of fresh water or milk. Apply the paste on your face and keep it until the paste dries. Wash your face with hot water by genteelly moving your hands on your face in a circular motion. Note: Apply either of the methods at least twice or thrice a week. It will help you to remove scars from your skin and lighten up your skin tone. The antibacterial properties of Aloe Vera help to kill bacteria that cause acne. The anti-inflammatory properties contribute to comfort antagonize skin. On the other hand, the astringent properties of Aloe Vera help to heal skin scars.It also moisturizes skin and encourages new skin cell growth. So using Aloe Vera provides multiple beneficial on the skin. 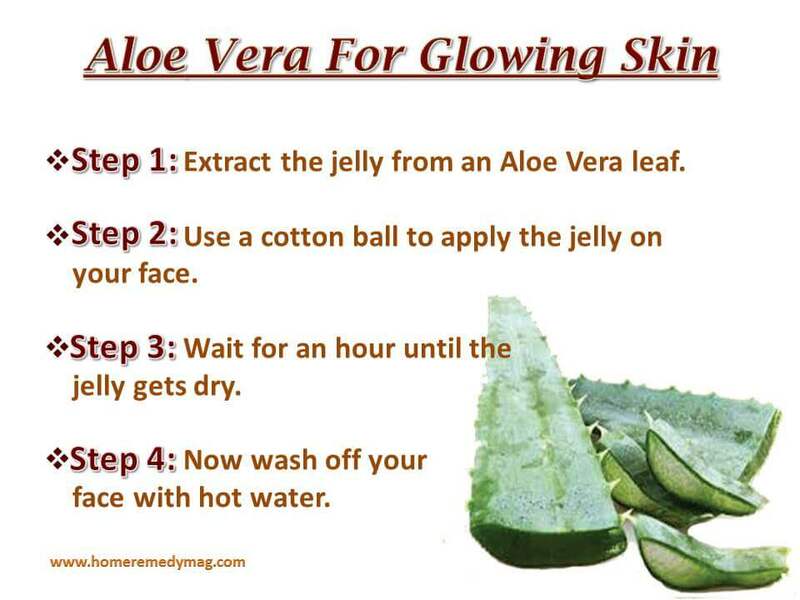 Step 1: Extract the jelly from an Aloe Vera leaf. Step 2: Use a cotton ball to apply the jelly on your face. Step 3: Wait for an hour until the jelly gets dry. Step 4: Now wash off your face with hot water. Note: Repeat the method on your skin several times a week. You already know the benefits of Aloe Vera, so apply it as many time as possible but not more than once a day. Exfoliate your face gently on a regular basis. If you are using commercial skin care product, then consider using products from the same family. For example, if you are using a facial scrub of brand “X”, then use toner and moisturizer of the same brand. Take care of your whole body skin, rather than the face only. Avoid using soap on your face and neck. Use powder or any gel type skin care product on those areas where your skin gets in touch with skin, such as underarms. Include Vitamin A, B and C in your daily diet. You will get vitamin A from Carrots, spinach or cereals. Eat meat, fish and soy for gaining Vitamin B and eat lemon and peppers for vitamin C.
Drink sufficient amount of water at least three liters a day. According to a skin care and skin cancer facts statistics, “Each year in the U.S. over 5.4 million cases of nonmelanoma skin cancer are treated in more than 3.3 million people”. So, you should start taking care of your skin by using these top five home remedies for glowing skin for getting rid of any skin problem. We’ve discussed 5 methods of how to get glowing skin. Apply these methods and get a soft, smooth, glowing skin.